What’s he going to do when Cadel retires? Back in 2007 Geoff Barrett was just an anonymous education consultant who, like the rest of us, enjoyed cycling in his spare time. But over the past seven years this likeable Western Australian has become one of the most recognisable fans in world cycling, perhaps behind only the ubiquitous and seemingly ageless Diablo himself, Didi Senft. Geoff is no ordinary teacher. He has an alter ego; a stalker of sorts, one that likes to dress up in public. 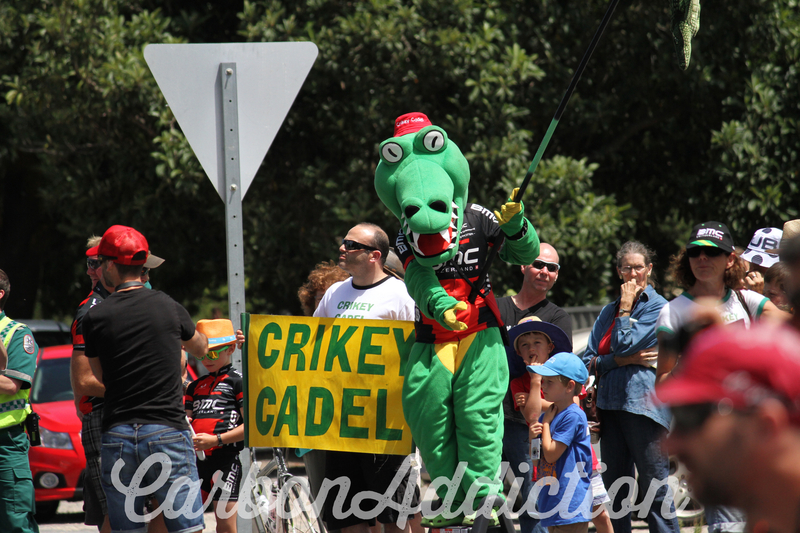 Since witnessing a devastated Cadel Evans on the Champs Elysees in 2007, having fallen just 23 seconds short of claiming the Tour de France, he’s been the guy in the fluffy green crocodile suit following Evans around the World Tour, aka Crikey Cadel. The object of the croc’s affection, Mr Evans. I bumped into Geoff, quite literally, at the start line of Stage Two at this year’s Tour Down Under in the swanky Adelaide suburb of Unley. After fighting off a bunch of kids chasing selfies with the croc (he has a Facebook page and uses the hashtag #SpotTheCroc if you’re interested) I managed to spend about 15 minutes with him and discovered a man not nearly as crazy as you might imagine, and one about to be faced with quite a dilemma. For when his very reason for existence, Cadel Evans, hangs up his racing cleats for good this Sunday afternoon, Geoff may well be forced to hang up his reptile suit as well. Nowadays Evans and his team-mates know Geoff as far more than just a roadside nutter from WA, and he’s met them on many occasions in many different parts of the world. This includes Andy Riis and Georges Lüchinger (BMC Chief Communications Officer) who, clearly, know good publicity when they see it. Will we see Geoff at Cadel’s final professional race this week in Geelong? “Of course, I’ll be there,” he says. “In fact I’ll even be riding in the People’s Ride on the Saturday.” It remains to be seen whether he’ll be in the croc suit or not. After that, who knows what he’ll do? Geoff hard at work, roadside on Stage 4 at the Tour Down Under in Meadows.